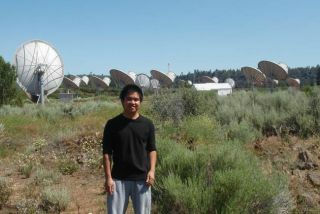 SETI student Vicente Gonzaga at the Allen Telescope Array in Northern California. I swerve wildly on my rickety bike, skidding on a soaked,winding path, squeezing my eyes shut and opening them in an attempt to get my eyesightback.? Just when I regain my bearings (but not quite my eyesight), a sharp crack!throws me off my seat.? I land awkwardly and stumble as the two dogs (Peach andJasmine) scurry away to avoid me.? Another flash sends them back up against my pant legs. ?They?re shivering ? fear?? Cold?? Probably both; thunderstorms aren?t exactlygreat experiences for most non-humans, or most humans for that matter.? Me,though - half blind and soaking wet, from the brim of my new baseball hat tothe socks in my shoes?? I allow myself a smile and continue my journey on footto the AllenTelescope Array (ATA).? It?s what I deserve, really, for leaving the SETItruck there. Besides, I had research to do. Granted, not every day in the 2009 SETI Institute Astrobiology ResearchExperience for Undergraduates (REU) Program is a rainy, thunder-strewn strollon the twisted path to the ATA--evenfor me, though that was my designated project site for the summer.? For most ofus, a typical day starts off with a breezy bike ride to the SETIInstitute or the NASA Ames Research Center after a shower and breakfast.? Atthe office, we sit down, maybe pour ourselves some tea or coffee, then getcracking on multivariable inverse trig integrals, running Mars images throughgeographic systems software, or observing data sent from the Cassini spacecraftfor spectroscopic lines that may indicate the presence of organic molecules onEnceladus, Saturn?s 6th largest moon. After a break for ping pong, we?re back for another fewhours of inverse trig integrals, or observing the comparative desiccationresistance in two strains of Halorubrum chaoviator (an archaealhalophile ? a single-celled salt loving microorganism).? At the end of the day,it?s a bike ride back to our quarters under a setting sun.? We wind down byreading a good book, studying for GREs, internet surfing, working out, orconducting a little more research on our laptops ? just for good measure. In essence, it?s your typical undergrad summer for sciencestudents.? While only one of us ever had to walk a mile in thunder and rain withwet dogs (they?re actually very adorable and friendly) just to take that lastmeasurement using the ATA?s hardware, you can safely bet that any of theother students in REU program would have gone to similar lengths for theirprojects. It?s been an awesome and unforgettable summer.? Actually, that doesn?t do this summer justice.? We?velearned and learned and learned some more ? from our projects, our mentors,even each other.? While we may not be experts at the end of this program in ourrespective fields, we?re definitely off to a good start. Take, for example, our trip to Lassen Volcanic National Parkduring the program?s third week.? We?re crunching along a lush hillside meadowwhen we stumble upon a crystal-clear bedrock stream trickling through thegrass, just a few inches wide.? Dr. Rocco Mancinelli (one of our tour guidesfor that week, and also one of the SETI Institute?s leading scientists onmicrobial life) stops, excitedly whips out a digital thermometer and severalstrips of litmus paper, and dips them into the water. Meanwhile we students are kind of exchanging bewilderedglances. Then he stands back up, one hand clutching a strip of litmuspaper right up against the sun, the other a color reference table, and heshouts, ?HA!? 65 degrees Celsius and somewhere between 3 to 4 pH!? Looks likewe have Cyanidium caldarium on our hands here.?? Then he plunges intothis lecture about warm, acidic streams and the microbial communities thatthrive in them.? We?re still exchanging glances, albeit with a little morepanic and bewilderment because our past impressions of miniature hillsidestreams are now gone.? Out the window.? Replaced by steaming acidmicrobe-ridden tides of death. Later that same week, we stumbled across something a littleless mind-shattering but arguably worse. Ben Ou-Yang describes the site of Dr.Mancinelli?s next field lecture in the video sidebar. His empirical observations are solid.? Bubbling.? Boiling.?Smelly. Dr. Mancinelli soon clarified that this was a sulfuric acid mud geyser(sulfur spring for short):? pH1, exceeding 93 to 95 degrees Celsius given our7000ft elevation, and teeming with microbial life.? We later went on to explorethe park and found watermelon snow.? It?s very beautiful stuff with streaksof bright, almost fluorescent red like brushstrokes on snow.? Chlamydomonas,a psychrophilic (cold-loving) organism, causes this watermelon effect. ?It?s actually a green algae. You should?ve seen Erin Lynch (Dr. Mancinelli?s REU studentfor this year?s program) when she caught me poking at the watermelon snow. Erin: ?WHAT ARE YOU DOING?? Me: *jumps* ?Huh?? What?? Nothing.? Erin: ?Are you TOUCHING it?? Me: *pokes the snow again* ?Well, yeah-? Erin: ?NO! STOP! YOU?RE KILLING IT!? They?re psychrophiles ? theyneed cold temperatures to SURVIVE.? Your finger is robbing them of theirideal temperature!? Me: ?OH CRAP.?? *starts piling snow on top of touched area* ?Okay, maybeI can make them cold again?? Erin: ?Annnnd now you?re blocking their sunlight.? They?re greenalgae ? they need to photosynthesize.? A little bit of my childhood was shattered (especially interms of miniature hillside streams and how I was committing genocide with myfinger), but I learned a valuable lesson. What we as human beings mayintuitively consider as ?livable conditions? have their limits.? Dr. RoccoMancinelli?s studies and observations show that life can thrive in even extremeconditions ? whether in the depths of glaciers, nearly devoid of warmth andsunlight, or in the scalding heat of sulfuric acid mud geysers.? This impliesthat the lush rainforests of the Amazon and our sprawling human cities are notthe only environments where life may thrive ? Dr. Mancinelli?s nature-editionlectures, taken with various talks hosted by the SETI Institute, have presentedcompelling arguments for life outside of Earth.? Cold,icy Enceladus, and overheated Venus begin looking more and more appropriateas hosts for extraterrestrial life. Again, we?re not experts, but we?re off to a good start. TheCalifornia Academy of Sciences in San Francisco has a planetarium exhibit whereviewers are taken through a panoramic, digital tour through the solar systemand beyond.? Imagine our smirks when the presentation reached Venus, and whenour digital host claimed matter-of-factly ?Venus? hot temperatures make it anunlikely candidate for hosting life.?? Nope, Ms. Recorded Voice, not quite ?not the way you postulated it.? Heat alone ? or in combination with an acidicenvironment, or in exceedingly cold temperatures without convenient access to aprimary source of energy such as sunlight ? is no longer a conclusive barrierto life development.? Unlikely, yes, but it wouldn?t have hurt to give Venus alittle more credit. Anyway, thanks, Dr. Mancinelli.? And he?s just one ofthe mentors and scientists here at the SETI REU 2009 Program who has taught usto see the universe around us in new ways, regardless of our backgrounds. We?re a group of university undergraduates from all over thenation, studying under this generation?s scientist A-team of planetary andextraterrestrial life scientists.? We constructed circuits and stuck extremelysensitive, expensive equipment inside giant metal chambers (well, I did), weused imaging software to map planetary surfaces, we wrote hundreds of lines ofcode, we stared at spectroscopic lines for signs of organic molecules, playedping pong, biked around Mountain View with reckless disdain for traffic lawsand common sense.? In short, we worked as astrobiologists this summer. We contributedto the expansion of planetary science, and we aided in the search forextraterrestrial life. And we all get to put this on our resumes..
Granted, this kind of summer isn?t for everyone.? Not everyundergraduate student enjoys summers spent on cutting-edge research with toptier scientists, and some people don?t dig weekend trips to San Francisco orfree food at the SETI Institute and the NASA Ames Research Center.? And yes,they dragged us, screaming and kicking, to Lassen Volcanic National Park, wherea handful of us climbed a 10,000 ft active volcano amidst snowy slopes and learnedin the process. If this sounds like your thing, SETI has a 2010 programlined up for next year.? Keep an eye out for it!? Applications will open inDecember. Those of us lucky enough to be selected for SETI Institute?s 2009 AstrobiologyREU Program will forever remember this summer experience.